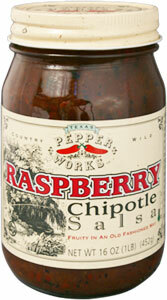 Texas Pepper Works Raspberry Chipotle Salsa is simply a combination of roasted tomato salsa and raspberry preserves. It’s great for dipping, over cream cheese at parties or slow cooking a pork loin. 16oz. Tomato, sugar, raspberry, chipotle pepper (chipotle pepper, tomato, salt, sesame oil, paprika, vinegar and spices), jalapeno peppers (jalapeno peppers, water, vinegar, carrots, salt, onions, sesame seed oil, garlic and spices), cilantro, salt, paprika extract and spices.